In 2009 we partnered with our friends at Shark Rescue to increase awareness of the importance of sharks to the sustainability of our oceans. Now we have tailored a new offer to help save sharks and bring a new level of perfection to your personal style. Why our interest in sharks? They are the most important sea predators that keep other marine species in balance. You could call them the lions and bears of the sea. Removing them from the chain would destabilize the entire ecosystem. One of the many consequences: no sharks = no more reefs = no more oysters to produce beautiful pearls! Rescuing the world's sharks and protecting our oceans is serious stuff, but no one said we can’t stay seriously fashionable while doing it. 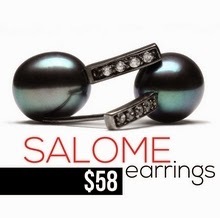 From now until June 5th, we're fundraising with style! 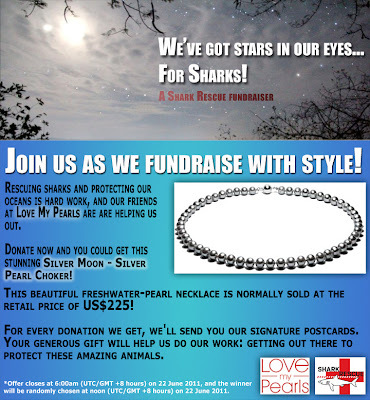 On June 5th, Shark Rescue will hold a lucky draw for one of our stunning Silver Moon pearl chokers. Enter now and you could win this beautiful pearl necklace which retails at US$225. To participate, simply visit the Shark Rescue Donate page and make a donation. For each donation received Shark Rescue will send you their signature postcards and enter your name once in the lucky draw. Your generous show of support will help Shark Rescue grow and conduct more DNA tests of shark fin soups served in hotels all over Hong Kong. Shark fin soup is one of the main reasons why sharks are so quickly nearing extinction. The more testing done, the higher the chances Shark Rescue and its supporters will be able to pressure hotels and restaurants to stop serving shark fin soup! The more times you donate, the more chances you have of winning – so donate now! *contest closes at 6:00am (UTC/GMT +8 hours) on 22 June 2011. The winner will be chosen randomly at noon (UTC/GMT +8 hours) on 22 June 2011. Are you in love? Are you getting married soon? Do you have troubles accessorizing the dress of your dreams? The match made in heaven does not need to refer only to your relationship. We have prepared an easy guide to help you with your jewelry choices. Nothing completes better a wedding gown and adds to its glamour than a well-chosen piece of jewelry. Pearls are considered as essential in bride’s and bridesmaids’ wardrobe. They symbolize love, purity and are believed to bring happiness and prosperity to marriage. True, not all brides pick pearls (oh, well, Kate, we forgive you, because you looked gorgeous anyway), but the versatility of pearl jewelry makes the choice easier for many. The safest approach is to follow the neckline of your gown with the shape of your necklace. A correctly chosen pearl jewel should not stand out too much and enhance your natural beauty instead of overwhelming it. Strapless neckline includes sweetheart and tube décolletés. It emphasizes your shoulders and the neck region. The right pearl wedding jewelry helps to compliment the top line of the dress and draws attention to your face. Many necklace styles work well with the strapless dress: close to the neck ras-du-cou, large pearl chokers resting at the collar bone and pearl necklaces in princess length are a good match. Multi-strand necklaces are also a great choice for the strapless wedding gown as long as you keep the necklace length at least one inch above the dress’ neckline to avoid overcrowding. A word of advice: remember that there are other pearl shapes than round that are great for the big day. 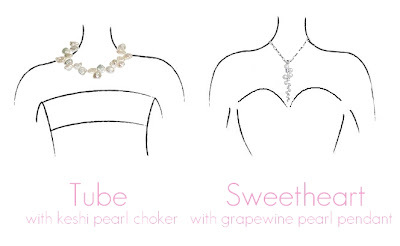 We absolutely love petal-shaped keshi pearls that bring this extra-feminine sparkle to your neckline. Lariats and simple pendants are great with sweetheart neckline as they imitate the top line of this type of wedding gowns. Although they also work for other strapless dresses, the lariats might be tricky if they go too low and touch the dress’ neckline. 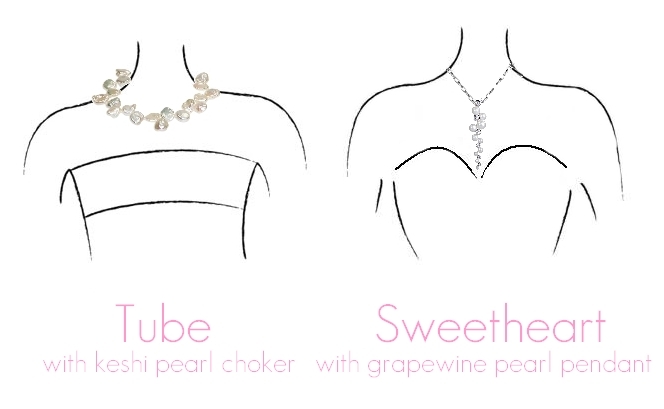 A general rule for bridal pendants is or to keep it short above the neckline or go in the opposite direction and use ultra-long chains and statement pearl pendants to enhance the bustier part of the dress. If you are not the biggest fan of necklaces, you might opt for chandelier earrings and an opulent bracelet instead. After all, the most important thing in choosing your wedding wardrobe is that you feel your beautiful and relaxed self in the first place! No bridezillas allowed!